Walking in the footsteps of a saint, the young page discovered miraculous warmth which gave him the strength and courage that he needed to perform the task at hand. When I try to think of what it means for me to be an Anglo-Catholic my mind is drawn to the image of the young page following Good King Wenceslas through the snow. In a world that is quite often dismal and bleak, I have frequently found myself, like that page, wondering if I have the wisdom or the fortitude to make it, and equally like that page, I have usually found my direction and my strength by following in the footsteps of saints who have gone before. To be an Anglo-Catholic, for me at least, is to be a Christian who is ever mindful of following closely in the footsteps of those who have already passed this way; it is to find strength, courage, wisdom, and direction by struggling to remain connected to other Christians across time and place. It is this desire to remain connected to other members of the body of Christ that is at the heart of what it means to be a Catholic Christian. I was born in 1979, which puts me right at the end of Generation X. I can remember a world before cell phones, but computers have always been a part of my life. My generation has been witness to, and in many cases the testing ground of, the ever-increasing individualization of Western society. I remember very well Burger King’s marketing slogan “Have it your way,” which became a catchphrase of my childhood that in many ways perfectly symbolized the zeitgeist of my generation. Be an individual; Do your own thing; Don’t follow the crowd. With the introduction of cable television and fast food, I grew up in a society that has sought relentlessly to separate people from each other under the battle cry of catering to the individual. It is interesting to me that during this period of rampant fragmentation of society, the most powerful tool for connecting individuals in the history of the world would be developed. Perhaps the tremendous power and meteoric rise of the Internet in our lives can be partly attributed to its power to connect individuals in a world that had become increasingly isolating. The Internet is a mixed-bag of course; it has the power to isolate as well as connect, but at its best it functions as an amazing tool that can connect people instantly across distance and even time. The power of the Internet and the power of the Catholic tradition both stem from their ability to help us connect with each other. As much as it may be gratifying at times to have all of my individual desires catered to, I have lived in this isolating world long enough to know that always “having it my way” is not the boon that it poses to be. I need to be connected to others. I need their insight and wisdom. I need their challenges to my way of thinking. I need their love and support. Having other people in my life is far more important to me than “having it my way,” and when I find something that can help me make those connections it is a truly valuable thing. Being a catholic means living my life of faith in connection with others. It means that I am a part of something so much bigger than myself. As an Anglican, it means seeing our church, though distinct, as a part of a larger whole and seeking to maintain that connection. But the connection that catholicity brings is not just about crossing political or ecclesiastical boundaries: it is about connecting across time as well. To be a catholic means to be connected to Christians throughout history. Things like scriptures, creeds and rituals are not meant for one generation only; they are the medium through which a connection is made from one generation to another. When I think about the things that are often of great importance to Anglo-Catholics, most of them, if not all of them, are in some way about making or maintaining connections. A couple weeks ago I had the great opportunity to spend a night on the Queen Mary, the classic Cunard ship that is now permanently docked in Long Beach, California. The Queen Mary was built in the 1930s, and although she has been updated as a modern hotel, she still retains many of the design elements of a bygone era. To wander around the Queen Mary is to live for a while in a world outside of time; it is to experience a connection to people and events from which we have been separated by the passage of time and life itself. During the Second World War, the Queen Mary was used as a troop transport ship, and it is possible that my own grandfather walked those decks just as I did. 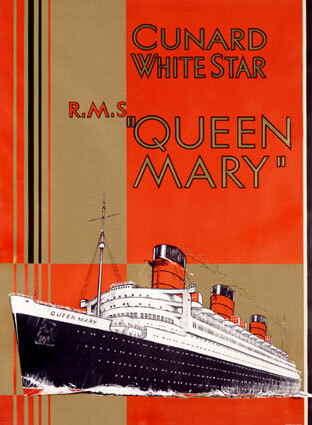 To some people the Queen Mary might be an obsolete relic from the past; to me it was a means to make a living connection with at least one person I knew very well, and some I never knew. In many ways my experience walking around this classic ship was very much the way I feel during a moving worship service: living outside of time and connected to people and places I never knew. I can admit that in many ways I fit the traditional Anglo-Catholic stereotype. On the shelf in my office are well-worn copies of both Ritual Notes and the Anglican Missal. I use them often, not as inviolable rules that can never be broken, but as wisdom from Christians who have walked this way before; sometimes we may disagree, but we always connect. That relationship, for me, is crucial to what it means to be a modern Anglo-Catholic: living in communion with people across generations and across time; It means making and maintaining the connection. Contrary to what some people think about Anglo-Catholics though, I have no desire to impose full Tridentine Mass ceremonial on the entire church. It resonates with me, but I understand how it might not always resonate with others. Catholic Evangelism is not about selling everyone on the idea of using birettas and maniples; it is about inviting others, both those already within the church and (even more importantly) those outside it, to make the connection to something larger. Our mission is to offer people a place and a community that exists outside of time; a congregation where saints and sinners that walked with Christ rub elbows with Christians from every generation since. Perhaps the reason why Apostolic Succession persists as a doctrine of fundamental importance to Anglo-Catholics is that in the simple ritual of one generation of bishops laying hands upon another we have represented what lays at the heart of our spirituality: making the connections with each other that ultimately lead us to making a connection with Christ. Our world can still be cold and dark. Life and time are ever trying to pull us apart. May we, as Catholic Christians, tread boldly in the footsteps of the saints that have passed before us, and find new life in maintaining the connection.